Christmas Day began with the girls snuggled in their beds. Santa made his drop off and it was like a bit of magic was left in our living room. 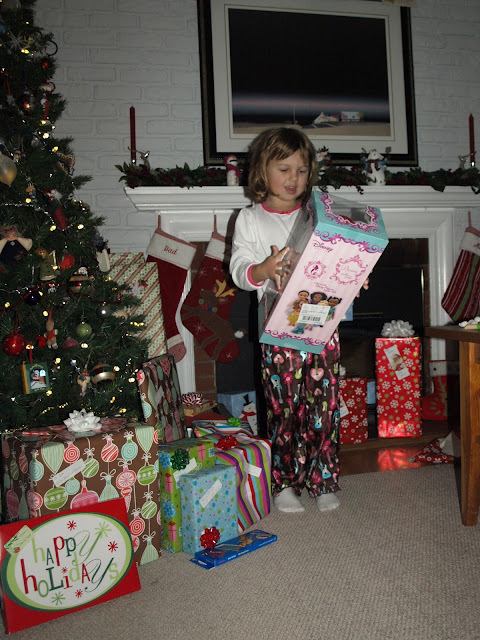 When the girls woke on Christmas morning the fun began with the dumping of the stockings. Nick captured a shot of everyone busy with present opening. He also caught Ana's ever sagging pjs. I guess those will need to go right in the donate bag. 6 fairies, 7 princesses, and additional Rapunzel, plus the larger Ariel and Snow White. I think our house has reach the quota on fairies and princesses. Nick is now fully entrenched in the world of being a dad to 2 girls. The aftermath... not so bad. But... that was after the wrapping paper was collected and bagged up and before the cardboard started to pile up! The rest of the day we were in the presence of a very cute pirate and a lovely pink princess. Ana actually didn't remove that pirate outfit all day long. She is the queen of dress up. And with that... the camera was put away. You can trust that we enjoyed the day. We had Christmas dinner here at our house with my Aunt Pru and Nick's parents. My brother-in-law, Gene and his family (Andrea, Larisa, Alex, Nina, and their Grammy and Poppy) came over for dessert. We had a full home. There are no pictures. That should probably suggest that we were oh so busy with cooking, and family, and Christmas magic. And when it was all done the next day brought us calm. Everyone in pajamas at noon. Random "things" found scattered about. But, there was a complete sense of calm. A perfect follow up to Christmas.